කීප දෙනෙක් කියල හා බ්ලොග් එකේ කමෙට් දාල තිබ්බ Google DNS හදන්නෙ කොහොමද කියල. ඒක නිසා හිතුව ඒ ගැන ලියන්න. ඒක හදන ක්‍රම කීපයක් තියනව. ඒ කියන්නෙ ඩයල් අප් වල, රවුටර් වල හා HSDPA මොඩම් වල විවිධ ක්‍රම ති‍යනව එකම සැකසුම වෙනස් කරන්න. එකෙන් එක බලමු. මගේ මතය අනුවනම් කොහොමත් Goole DNS හා Open DNS හි වේගය අපගේ සේවාසපයන්නන්ගේ සැකමුම් වලට වඩා හොදා. සමහර අවස්ථාවල අපගේ DNS සර්වර හරිහැටි ක්‍රියා නොකරන අවස්ථාවලදීත් මෙය භාවිතා කල හැකිය. මාගේ නිරීක්ෂණය අනුවනම් SLT වල DNS වල‍ට වඩා Google වේගවත්. Windows 7 හෝ Vista වල ඔරලෝසුව අසල ඇති නෙ‍ට්වර්ක් හෝ වයර්ලස් අයිකනය ක්ලික් කර Network and Sharing Center වෙත පිවිසෙන්න . 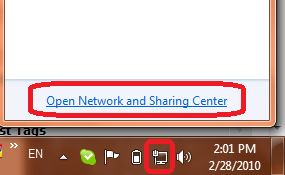 නැතිනම් Control Panel හි Network and Sharing Center ‍(මෙය සමහර විට Network And Internet හි Network and Sharing Center ‍නමින් ඇත) . 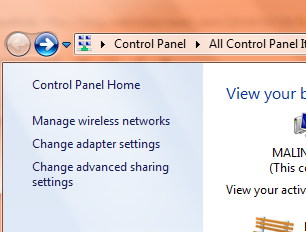 වින්ඩෝස් Xp නම් Control Panel හි Network Connection නමින් ඇක. ඉහත නෙට්වර්ක් එක හා සම්බන්ධ වන සම්බන්ධතාවය තේරීමේදි වයර මගින්නම් Local Area Connection ද WiFi මගින්නම් Wireless Network Connection ද තේරිය යුතුය. 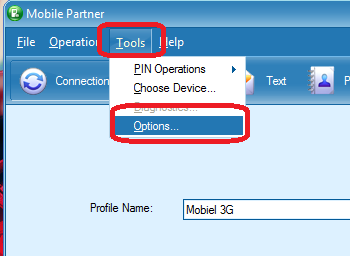 එය Network And Charing Center හිදි හෝ Change Adapter Settings (Xp නම් View Network Connection) වෙත පිවිසීමෙන් තෝරාගත හැකිය. 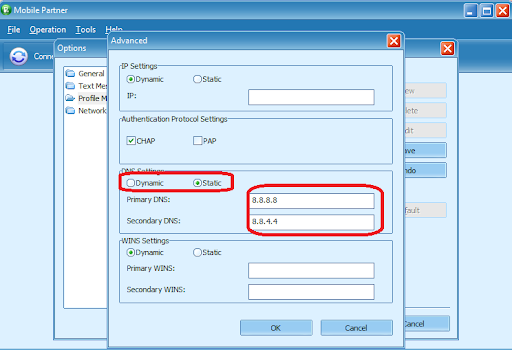 එහි තම පරිගණකය ස්වයංක්‍රියව ජාලයේ IP (DHCP මගින්) ලබාගන්නේනම් Obtain IP address Automatically යන්න තෝරාඇත. නැතිනම් ඒවා ලබාදීමට සිදුවේ. සාමාන්‍යයෙන් රවුටරයක් IP ලිපිනය ස්වයංක්‍රියව ලබාදෙන නිසා එය Obtain IP address Automatically ලෙස තිබීම ප්‍රමාණවත්. අපට DNS සැකසුම් කිරීමට අවශ්‍යය නිසා පහලින් ඇති කොටසේ Use the Following DNS server address යන්න තෝරන්න. එවිට පහලින් ඇති ටෙක්ට් බොක්ස් සක්‍රිය වනු ඇත. 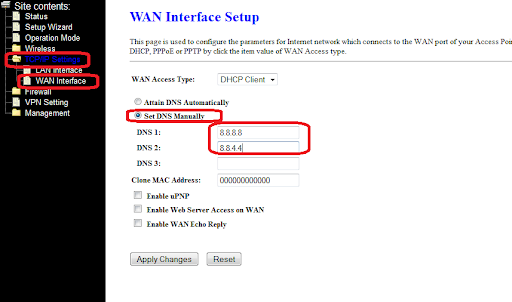 එයට DNS සර්වරයන්ගේ ලිපින ලබාදෙන්න. ඉන්පසු OK කර එම කවුලු වසාදමන්න. 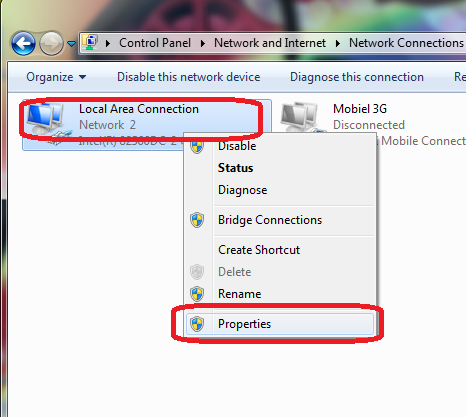 මේ සියලු ක්‍රමයන්ගේ සැකසුම් ඉහත Local Area Network හෝ WiFi මගින් සම්බන්ධ වනවිට හා බොහෝ සෙයින් සමාන වන අතර නමුත් එය පියවරෙන් පියවර පහත දක්වා ඇත. 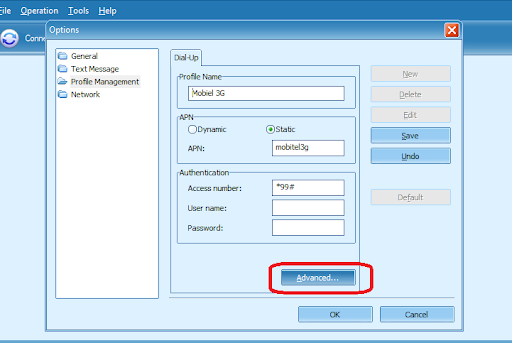 HSDPA වැනි වෙනත් මෘදුකාංගයක් (Mobile Partner) මගින් සම්බන්ධවන විට මෙම සැකසුම් මෙසේ කලත් නැවත එම මෘදුකාංගය හරහා සම්බන්ධවන විට ඒව එම මෘදුකංගය අනුව සකසාගන්නා නිසා ඔබ මෘදුකංගයෙන් සම්බන්ධ වන්නේනම් එම මෘදුකාංගයේ සැකසුම් කිරීම ප්‍රමාණවත්. නැතිනම් එම මෘදුකාංග තිබුනත් සාමාන්‍යය ක්‍රමයට වින්ඩෝස් මගින් සම්බන්ධ වන්නේනම් ඒ සඳහා මෙම සැකසුම් කිරීම සැහේ. ඉහත නෙට්වර්ක් එක හා සම්බන්ධ වන සම්බන්ධතාවය සොයාගැනීම ආකාරයට හෝ ශෝට්කට් ඇතිනම් එමගින් හෝ වින්ඩෝස් 7 හි Icontray හි වයර්ලස් අයිකනයෙන් ්හෝ නෙට්වර්ක් අයිකනයෙන් අපගේ සම්බන්ධතාවයේ Properties වෙත පිවිසිය හැකිය. 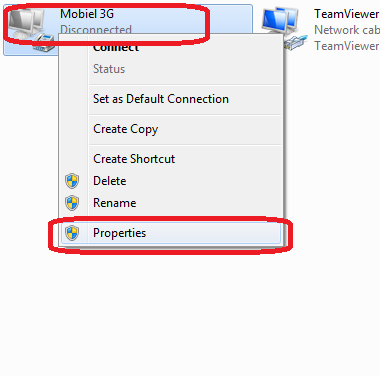 Vista හා XP වලනම් Start හි Connect to මගිනුත් සම්බන්ධතාවයන්ගේ Properties වෙත පිවිසිය හැකිය. 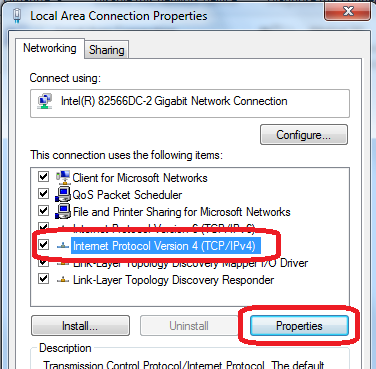 එහි Networking ටැබයේ ඇති ලැයිස්තුවෙන් Internet Protocol Version 4 (TCP/IPv4) තෝරා Properties බටනය ක්ලික් කරන්න. සාමාන්‍යයෙන් Dialup හා ADSL, HSDPA සම්බන්ධතාවන්ගේ IP ‍සේවාදායකයා විසින් ලබාදෙන අතර අප DNS සැකසීම ප්‍රමාණවත් වේ. ඒ සැකසීමට Use the following DNS server address ලබාදී පහත කොටු තුල DNS සර්වරයන්ගේ ලිපින ලබාදෙන්න. HSDPA සම්බන්ධතා සඳහා Mobile Partner මෘදුකාංගයේ සැකසුම්. 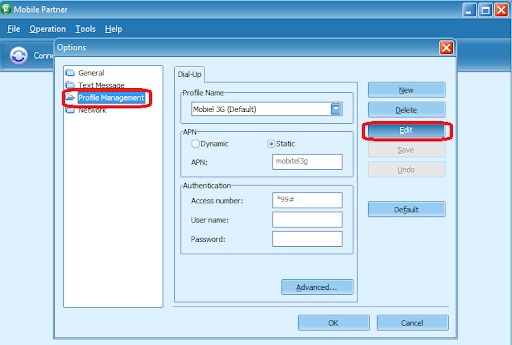 වම්පස තිරුවේ Profile Management තෝරා තමන් සම්බන්ධ වන සම්බන්ධතාවයේ Profile Name තෝරන්න. Profile නැතිනම් එකක් සාදාගන්න.ඉන්සපු EDIT ක්ලික්කර Edit Mode එකට පිවිසෙන්න. අන්තර්ජාලය සඳහා ADSL හෝ WiMax සම්බන්ධතාවයක් භාවිතාකරයිනම් ඒ සඳහා ADSL හෝ DSL රවුටරයේ සැකසුම් කිරීමෙන් මුලුජාලයේම DNS සැකසීම එකවර කල හැකි අතර එවිට ජාලයේ පරිගණක ස්වයංක්‍රියව රවුරයෙන් ලබාගන්නා DNS ලිපිනය (රවුටරටයේ) තිබුනත් රවුටරයේ DNS ‍වෙනස්කල නිසා එම සර්වර හා සම්බන්ධවේ. විවිධ රවු‍ටරවල විවිධාකාරයෙන් සැකසීම් ඇති අතර ලබාගත් රවු‍ටර කීපයක විස්තර පහත දැක්වේ. සමහර රවුටර වල අන්තර්ජාල සම්බන්ධතාවය සැකසීමේදීම DNS සර්වර ලබාදිය යුතු‍වේ. එසේනම් සැකසීමේදී හෝ එම අන්තර්ජාල සම්බන්ධතාවය Edit කිරීමෙන් DNS මාරුකරගත හැකිය. 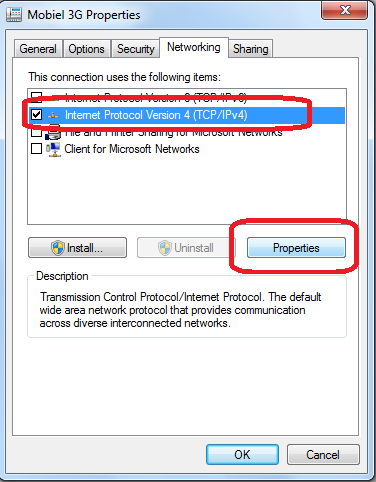 සමහර රවුටර වල TCP/IP ය‍ටතේ හෝ DNS Server නමින් වෙනමම සැකසුම් කිරීමට ඇත. කරලම බලමුකෝ. මට තියෙන්නෙ SLT ADSL. ayiya slt adsl walata google dns dammoth speed aka wadi wenawada. හොද ලිපියක් මට ගොඩක් වැදගත් මේක. නියම ලිපියක්.දිගටම මේවගේ ලිපි ලියන්න. slt broad brand 1GB pakage akak thamai maga thiyanna.unlimited use karanena hack karana kramayak nadda? ඔහොම කලහම වෙනදේ සරලව කියන්න පුලුවන්ද? Goole DNS? 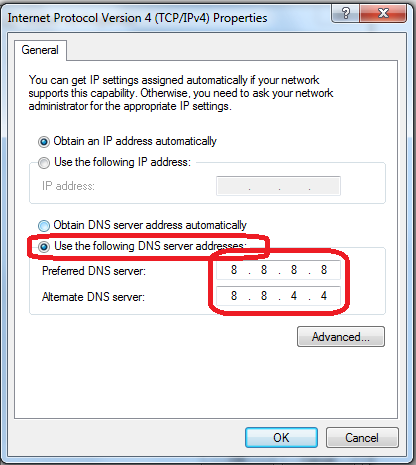 OPEN DNS? 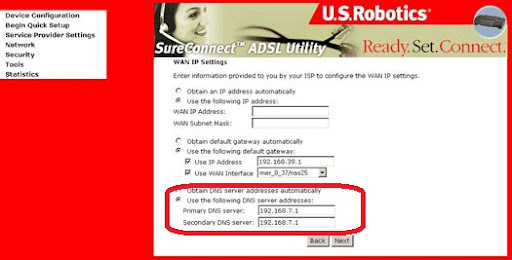 ADSL router ekaka DNS server address 1 lesa laba diya uththe mokakda? 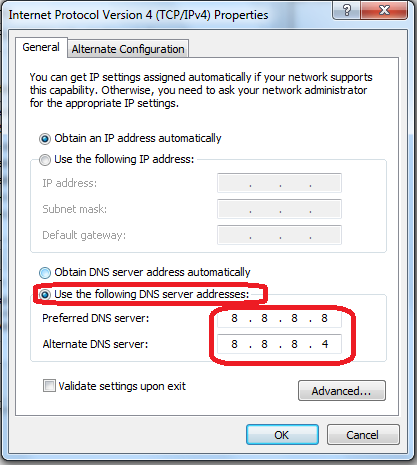 This is the turn Google DNS/Open DNS Configuration Step by Step sinhala guide for LAN/Dialup/HSDPA/ADSL and DSL Router | Malinda's Blog – à¶¸à·à¶½à·’à¶±à·Šà¶¯à¶œà·š à·ƒà¶§à·„à¶± blog for anyone who wants to essay out out most this substance. You attention so such its almost exhausting to represent with you (not that I truly would want…HaHa). You definitely put a new twisting on a subject thats been typewritten near for eld. Respectable block, simply majuscule!